In Delaware, there are nearly 675,000 licensed drivers traveling the state’s roadways. The majority of those drivers are attentive and law-abiding, doing their best to reach their destinations safely. However, some drivers make poor choices on the road, and that negligence can have lasting consequences for other Delaware drivers and passengers. In the instant that a driver nods off behind the wheel, tries to speed around other traffic, or engages in any number of risky driving behaviors, an accident can occur. During 2014, there were over 7,500 injuries and 125 traffic deaths, many of which could have been prevented with a simple degree of care. The experienced Delaware car accident lawyers at Morris James Personal Injury Group understand how an accident that occurs in just one moment can impact you and your family for years to come. Over the course of our combined 150 years of practicing law, we have helped thousands who have been hurt in auto accidents obtain the compensation necessary to ensure proper medical care and a secure future. If you or someone you love has suffered injuries in an auto accident, our skilled lawyers may be able to help. Take a moment to fill our online contact form for a prompt response from a member of our team. We’ll contact you to learn more about your situation, explain what you need to do after your accident and help you understand your rights under Delaware law. Why File an Auto Accident Lawsuit in Delaware? When Do I Need to File My Car Accident Case in Delaware? Every state sets deadlines for pursuing a lawsuit against the person responsible for an accident and injuries. This time limit is known as a statute of limitations. Delaware law states that you have two years from the date of the accident to pursue legal action for personal injury and property damage. For victims who were involved in accidents with government entities, such as someone involved in a traffic accident with a city bus, the deadlines may be. Every government division has its own set of rules, but a skilled car accident attorney can help investigate the situation and determine when to take action. If you miss the deadline and attempt to file a claim after the statute of limitations has run out, the court will refuse to hear your case. Though there are exceptions, it is important to start the process as soon as possible to ensure your voice is heard. Additionally, insurance companies have their own deadlines for submitting claims, so you should investigate the details of their policies as soon as possible after an accident. Why Do I Need a Delaware Car Accident Lawyer to Pursue an Insurance Claim? Car accident cases can quickly become complicated, and Delaware auto accident compensation can be affected by many factors. One significant factor is the type of auto insurance. Delaware drivers can elect to carry varying degrees of insurance, covering bodily injury, property damage, and personal injury protection. While the state does set minimums, situations arise where the cost of serious injuries can exceed the protection of the driver’s insurance. Additionally, the law takes into account the severity of the injury when determining compensation. While even seemingly minor injuries can evolve into serious health concerns, there are a number of commonly acknowledged grave injuries. These injuries include brain and spinal cord injuries, broken bones, burns, amputations, pregnancy complications, and death. When someone experiences any of these debilitating harms, proper care can require many doctor appointments, a myriad of medications, lengthy rehabilitation, and serious financial limitations. Generally, the more serious the injury, the more compensation is awarded. The skilled attorneys at the Morris James Personal Injury Group have extensive experience protecting the rights and securing damages for accident victims. Our team understands the complexity of auto accident cases and knows how to fight to ensure the maximum compensation to help victims recover physically, emotionally, and financially. Long-lasting consequences can occur after any type of crash. If you are unsure if you can pursue legal action after your accident, chat live with a member of the Morris James Personal Injury Group today. Our lawyers can help you learn more about your rights, understand Delaware law, and decide what the most appropriate next step may be. One important factor in deciding whether or not to pursue a personal injury lawsuit in Delaware is the state’s rules about fault. Determining fault in a personal injury case can be difficult, and in the state of Delaware, that determination can have a significant impact on a lawsuit. Delaware is what is known as a comparative negligence state. This means that the potential negligence of all drivers is considered. A driver that holds more than 50 percent of the blame is barred from pursuing any compensation. A driver that is less than 50 percent responsible, may pursue a claim against the other party, but any compensation awarded will be reduced by that driver’s percentage of fault. For example, if one driver disregards the rules of right of way and turns into an oncoming car in an intersection, he would be at fault for the accident. If, however, the oncoming car was speeding, it may be decided that driver was partially responsible. If the court rules that the speeding driver was 15 percent responsible and the turning driver was 85 percent at fault, the speeding driver’s compensation could be reduced by 15 percent. A skilled and knowledgeable attorney can help you understand the state’s fault rules and prepare a comprehensive case to support your claims for compensation. How Do I Know When I am Eligible to Make a Claim? These kinds of accidents and others can occur at any time, in any place, with even an experienced driver. In some cases, an accident may occur outside the state of Delaware. Victims are still entitled to pursue compensation for their injuries in those instances. The case may be more complex depending on the state in which the accident occurred. Some states are considered no-fault states, but even in those states, victims are able to recover money to ensure they receive the proper medical care and safeguard their future financial security. Victims can include drivers and passengers involved in the accident. 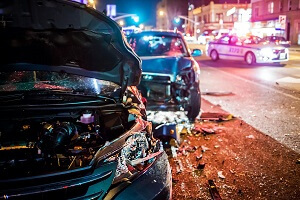 Additionally, even if you are driving someone else’s car, you may still be able to obtain compensation to cover any injuries or property loss that occurred in a traffic accident. Permissive use covers anyone a vehicle owner gives permission to drive that vehicle. Though it is not commonly known, auto insurance in Delaware follows the car, not the driver. The car is still covered by insurance in most cases. How Can Our Delaware Car Accident Lawyers Help You? You should not have to suffer without recourse because of someone else’s negligence. Many car accident victims face long-term health problems, mounting medical bills, emotional scarring, and a reduced ability to earn income. Not only do the lawyers at the Morris James Personal Injury Group understand the serious consequences these accidents can hold for you and your family, we know what it takes to win these cases and secure the compensation that is desperately needed. Our Wilmington, DE car accident lawyers helped countless accident victims ensure they get the treatment and financial resolution they need to move forward with their lives. In car accident cases, fault must be assigned and often insurance companies must get involved. Opposing parties will do whatever they can to protect their own interests, regardless of the severity of your injuries or the truth. Our car accident lawyers in Wilmington, DE work hard to investigate the accident circumstances, gather evidence, prepare a thorough argument, and present a cohesive, comprehensive case. We know what is fair and what is not, and we will not be bullied or intimidated by a large insurance corporation into accepting less than our client deserves. Do not let the insurance companies take advantage of your vulnerability following a car accident. You need a knowledgeable and determined advocate who will protect your rights and help you meet your goals. If you or someone you love has suffered injuries in an auto accident, fill out our online contact form for a prompt response from a member of our legal team. We’ll help you learn more about Delaware car accident law and protect your rights today.